In New York, its very hard to find certain places that sell Japanese merchandise. However, if you wanted to go anywhere to buy those kinds of things and more, Kinokuniya Bookstore is where you should be headed. Kinokuniya Bookstore is originally a Japanese bookstore that first originated in Shinjuku, Tokyo. After only being in Japan, Kinokuniya has spread into countries such as Singapore, Malaysia, Thailand, Taiwan and even here in the United States. The Lobby floor consists of books about geek culture, keychains, nonfiction and other genres of novels. There are also books that help express and share new cultures for everyone to learn about. The basement floor is where things become a little more interesting with fashion magazines, art supplies, and a few anime and manga magazines. Searching around you should find Torotoro plushies, copic markers, Nintendo hanafuda cards and DIY jewelry. Until you realize there is an upper floor, thats where things get very fun for those that love anime. 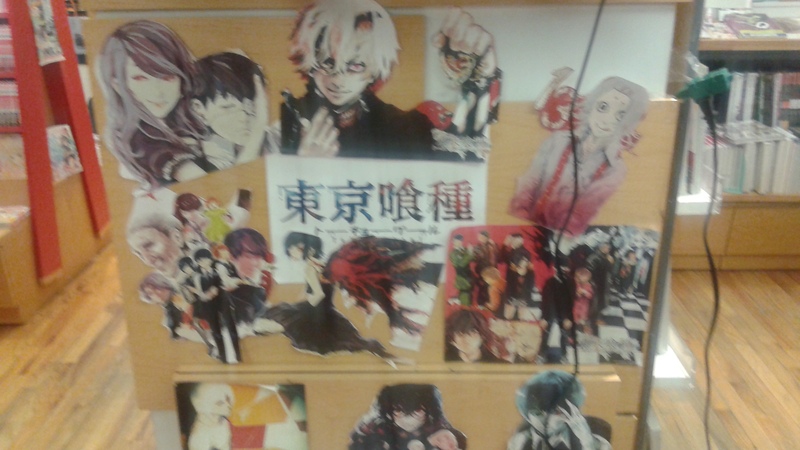 Along with a small cafe, there are tons of anime merchandise. Video game guides, the latest manga of any series, Illustration art books, music CDs, anime DVDs, posters and figurines can be found and fill your nerdiness to your heart’s content. Some of the rarest items can be found at Kinokuniya. Even though most of the merchandise is in japanese, you would still be able to go crazy just deciding what to buy. Beware that you may need a lot of money if you plan on geeking out, the lowest you should bring with you is probably $25 considering the fact that almost everything is imported from Japan. They even contain merchandise of series such as Durarara, Tokyo Ghoul, Mekakucity Actors and Free that is hard to find anywhere else other than online. Kinokuniya Bookstore has multiple locations in America and around the world. You can visit their website www.kinokuniya.com for more information. As mentioned in previous article, some (probably) scam sites are using our name to sell Japan gift cards. We thought we should go a little further step to protect our customers. A few days ago, we decided to contact those sites. Many sites out there are doing the same business as us, but copying and using our name make customers confused. We politely asked them to stop copying our site and stop using our name, but they have yet to respond. The former site might has been abandoned for some times, but the latter’s social account is still actively posting status. We’ll update when we got their response. Beware of Scam Sites Using Our Name! We have receive complains about customers purchase gift cards from Japan Codes but never get it delivered to their email. We have heard complain about customers being contacted by Japan Codes to advertise and convince to buy gift cards. Please be noted that we never contact our customers and ask them to buy anything. Please beware that there are some sites out there using our name and pretend to be Japan Codes. https://www.japan-codes.com is our only official site. We have no relationship with any of those sites. We will not be responsible for any loss or whatsoever caused resulting from a buying gift cards from one those sites. We want to inform you that these sites may be scams. We do not like to see our customers taken advantage of and felt it was important to let you know about this issue.